this week's grail or fail is all about drugstore eyeliner. if you watch my videos you know i am a HUGE fan of Rimmel pencil eyeliner. 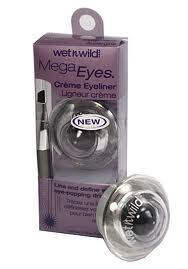 inexpensive eyeliner will often have better staying power, heavy pigment, and did i mention the cost? i have owned this eyeliner for several years now. i mainly use it for lining the water line of my eyes and occasionally i'll use it as a traditional eyeliner (i typically prefer liquid liner for my lids). this product is a definite Grail. pick one up for yourself at any Target, Walmart, CVS or Walgreens. however, let me warn you, not all drugstore eyeliners are created equal. i found this Wet n' Wild eyeliner and thought it would give it a try. this eyeliner was a fail for me. i was intrigued by the free brush and the fact that it came in a pot. that's about all i found this to offer. the application was not smooth and the color actually stained. call me crazy but anything that stains my eyelids makes me a little uncomfortable. Oh, oh!! I love rimmel eyeliner! Yes - I feel so good about myself for owning a grail. I completely agree about the Wet & Wild - even their pencil liners are horrible, I felt like I was impaling my eye just trying to get any color on there (lovely image, I know). Speaking of which - where did you find Wet & Wild? I need to buy an eyeshadow that they make but I can't find it at target, kroger or anywhere else. I'm on my last crumbs of it!